Sure, sure, there’s a giant owl in the Monster Manual. But all it does is swoop and attack with claws. Let’s make something scary, like the Great Owl from The Secret of NIMH. To me, the scary thing about a giant owl would be its silence and its rending beak. You don’t hear the owl coming up to you, and if you get into its beak, it’ll rip your arm off. 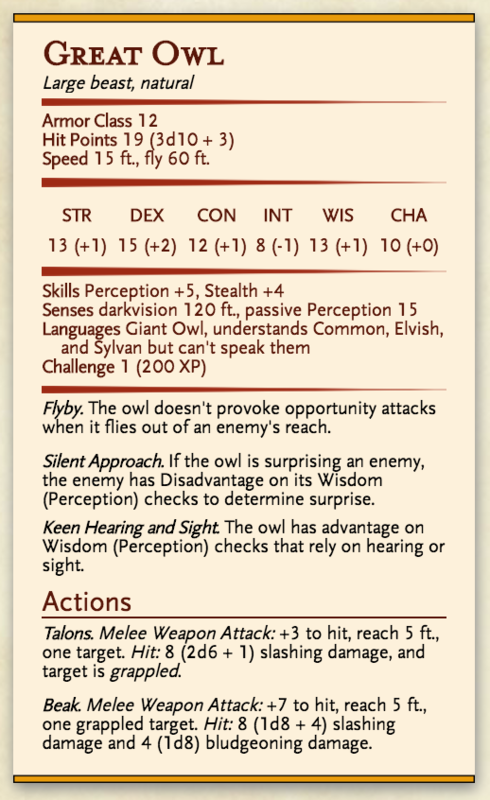 So, let’s turn the Great Owl into a grab-and-attack creature, and give it the ability to approach silently from the air. It’ll be on a group of adventurers before they know it. But what’s the extra challenge of a Great Owl fight, and what’s reward? Owls tend to nest in forests, so let’s say that Great Owls generally nest in dense parts of forests where movement is limited. Let’s further say that Great Owl feathers and eggs are extremely valuable. And now we have our Great Owl. > – **Speed** 15 ft., fly 60 ft.
> ***Flyby. 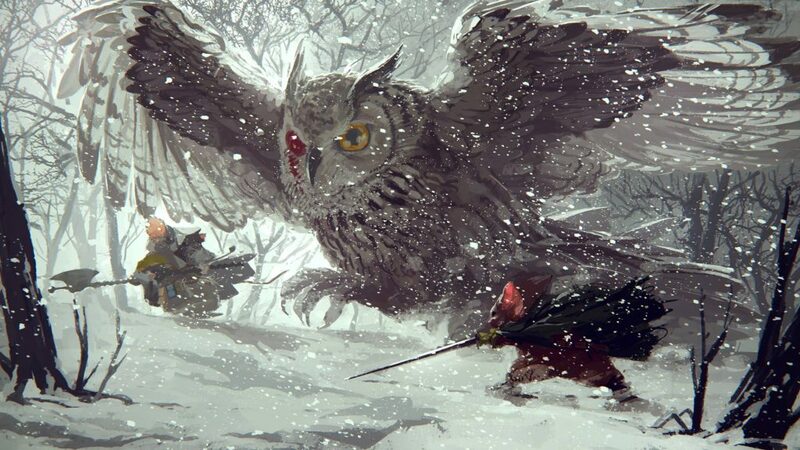 *** The owl doesn’t provoke opportunity attacks when it flies out of an enemy’s reach. > ***Silent Approach. *** If the owl is surprising an enemy, the enemy has Disadvantage on its Wisdom (Perception) checks to determine surprise. > ***Keen Hearing and Sight. *** The owl has advantage on Wisdom (Perception) checks that rely on hearing or sight. > ***Talons. *** *Melee Weapon Attack:* +3 to hit, reach 5 ft., one target. *Hit:* 8 (2d6 + 1) slashing damage, and target is *grappled*. > ***Beak. *** *Melee Weapon Attack:* +7 to hit, reach 5 ft., one grappled target. *Hit:* 8 (1d8 + 4) slashing damage and 4 (1d8) bludgeoning damage.